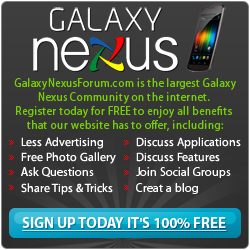 Below you will find a list of discussions in the New Member Introduction & Site Assistance forums at the Galaxy Nexus Forum - Samsung Galaxy Nexus Community. The New Member Introduction & Site Assistance forum is for discussion of: If you are new to the site please introduce yourself in here. If you have questions on how to use the site this is the place to ask! If you are having difficulty starting a new thread in this section, this convenient link should start a new thread for you: Simply Click Here.. If you are new to the site please introduce yourself in here. If you have questions on how to use the site this is the place to ask! If you are having difficulty starting a new thread in this section, this convenient link should start a new thread for you: Simply Click Here. Sticky: New To Android?!? Check This Out! Sticky: Welcome to the site! Please post an introduction thread. All times are GMT -6. The time now is 10:59 PM.